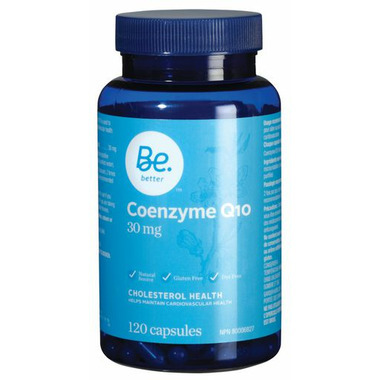 The Be Better Coenzyme Q10 is a natural, gluten free, and dye free supplement that helps maintain cardiovascular health and cholesterol levels. Ingredients: Coenzyme Q10 (bacteria or yeast) --- 30 mg, Microcrystalline cellulose, gelatin capsule (gelatin, purified water). Dosage: 2 capsules, 2 times daily, preferably with meals, or as recommended by a physician. Consult a physician prior to use if you are pregnant or breastfeeding, or if you are taking blood pressure medication or blood thinners.